Behind the Scenes of "The Muppet Movie"
Discussion in 'Classic Muppets' started by Was Once Ernie, Jun 24, 2005. Thanks for making me feel so welcome. The short version of how I got the gig is that when I read that they were going to shoot the movie in Hollywood, I just contacted Jim. I already had a relationship with him dating back 7 or 8 years at that point. He said they might need some extra puppeteers at some point and he would contact me if they did. They did and he did. This was for the big finale, in which almost every Muppet character ever built was to appear. I don't believe the Saturday Night Live characters were included... and probably not some of the earliest Muppets, particularly the Sam & Friends characters... but everyone else was there. We rehearsed for awhile by just holding our bare hands up in the air and doing the mouth movements to the song. It was tricky because there are pauses between "Thanks to the lovers... the dreamers... and you" and you just had to feel the pauses. You didn't want to anticipate the words and open the mouth too soon, just as you didn't want to be late. We then went over to the stage we were shooting on. As many of you know, most of the time, the Muppets work standing up with the puppets raised over their heads. This means that the sets are either built up on stilts or the performers have to be standing in a trench. For this shot, they built up the entire stage floor, leaving an oval shaped hole where all the puppeteers stood. The camera was then on a huge crane that had to roll all the way to the back wall and the top corner of the soundstage to fit all the characters in. The other technical problem was the rainbow. They shot it two ways. First, there was a giant scrim hanging across the stage with a rainbow painted on it. A scrim is a theatrical netting that when you shine light on it from the front, you can see what's painted on it, but when you shine light behind it, you can see through it. The other way was to remove the scrim and put the rainbow into the film optically in post production. Can you guess which method was used in the final film? It seems like you knew Jim on a personal level, almost like family. How did you come to meet him? And was puppetry always something you wanted to do? Or did knowing Jim inspire you to do so? Oh my! This is an awesome story! Can't wait for part two! So, THAT was how they did the rainbow? I always wondered. That is, asuming they did in fact use the scrim. Is that what they did for the other time it burst in, do you know? Which Muppet were you performing in the end? Great story. It seems the ending and the beginning where Henson was performing Kermit in the swamp were the hardest to do. Wow, that's awsome! Thanks for telling us about it! I wouldn't say quite like family, but he was very nice to me when there was nothing in it for him to be that way. He always indulged me, talked to me on the phone, let me come to tapings and even watched a pilot for a children's show that I did and critiqued it for me. In the early 70's, I was working at New Jersey Public Broadcasting. I mailed Jim my "Pictorial History and Resume", which was basically my resume with a bunch of cartoons interjected in between my work experience. It made an impression and he remembered me from it. At some point, I just called him on the phone and because he remembered me, he took the call. After that, any time I called, he would talk to me. I can't imagine getting to the head of a company that easy nowadays, but remember, although the Muppets were well known by this time... many appearances on Ed Sullivan, Rowlf on the Jimmy Dean Show and into the third year of Sesame Street... this was before "The Muppet Show" and superstardom. I think I was always interested in puppetry. I watched all the early TV puppet shows... "Kukla, Fran and Ollie", "Howdy Doody", "Time for Beany", plus ventriloquists Paul Winchell and Shari Lewis. But I would say the Muppets definitely increased my desire to be a puppeteer. Wonderful story, thanks for sharing, I'm looking forward to part two very much. This is such an awesome story! I can't wait to here the rest! You could be right. I don't remember. But it would have made sense for them to be there. The answer is, the rainbow was put onto the film optically in post production. I think they felt that the scrim muted the colors of the Muppets too much. Next, it was time to assign puppets to everyone. All the puppeteers were divided by height. Since I'm fairly short, I was sent to stand in the "Emmett Otter" line, because those characters are small and would be in the front of the pit. I waited in the line for a few minutes and then when no one was looking, I sneaked over to the Sesame Street line. They were giving out the minor characters and Anything Muppets first, so when I got to the front of the line, I boldly asked, "Can I have Ernie?" The person giving out the characters said, "Sure. You might as well take Bert, too." (Many people had to do two characters because there were so many and so little space). But then he thought better of it and said I should just take Ernie. Everyone had to be checked out by one of the main guys. They would decide if the character you had was right for you... or they might switch you with someone else. I knew I had to think of something to pass this test. I fumbled around, trying to put him on for the first time. As most of you probably know, some of the puppets have working hands, as opposed to the charcaters that have rods in their arms. Ernie has working hands, while Bert has rods. 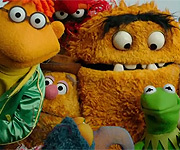 In the case of the hand puppets, generally the puppeteer works the mouth with his right hand and the character's left hand with his left hand, then a second puppeteer works the right hand. They coordinate movements by watching their performance in a TV monitor. Since there wasn't going to be a second puppeteer, they stuffed Ernie's right arm and pinned it up so it wasn't hanging loose. I finally got my left hand into Ernie's hand (it goes in through an extra sleeve attached at the elbow). Then I put my other hand in his mouth. Ernie has a large mouth, so in order to be able to operate it, there are levels of board built up on the inside, leaving specific finger spaces on the top and one on the bottom for your thumb that you can grasp. I mastered it just in time for Jim to check me out. I walked up to him, held out Ernie's arm toward him, and in Ernie's voice, I said, "Daddy!!" Jim smiled and said, "Oh, good. You keep him." I had passed the test and would remain Ernie for the rest of the shoot. I guess I do a pretty good Ernie, because people who didn't know better kept asking me if I was the real Ernie. Of course I told them I was... no, I didn't... I always told them it was Jim. But that was a very flattering comment for them to make. But here's a little surprise quiz: Can you guess what well-known film director was the Muppeteer for Grover in this sequence? This is very cool once was ernie did you ever get to be come a muppeteer? That's awesome! You sneaked over to Sesame Street, he he. "Daddy" was brilliant. Can't wait for more! I have read that it was john landis, although I believe I have read that steven spielberg was also in this sequence. Why did a director perform in that scene anyway? 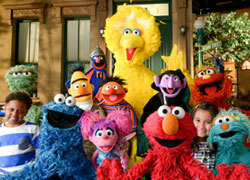 Do you know why Jim Henson didn't include any of the earlier Sam And friends muppets in that scene?